SCVHistory.com LW3461 | Ridge Route | Winter Scene at Frazier Park, ~1930s. 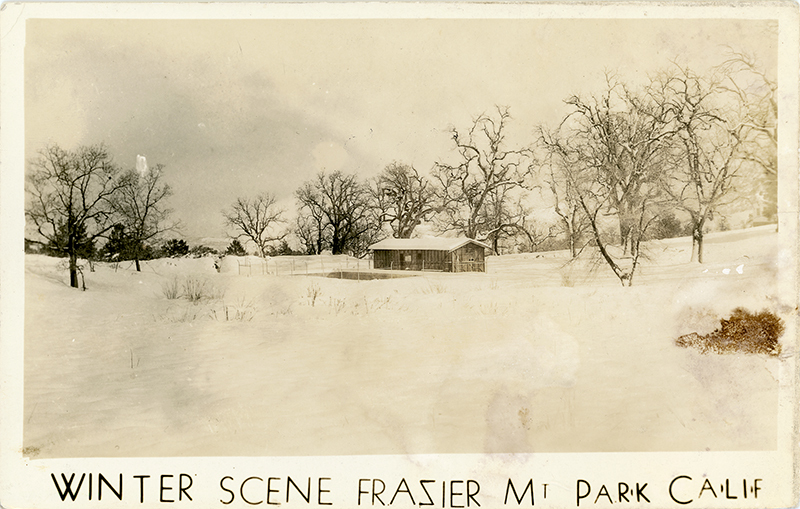 Winter scene, Frazier Park (as Frazier Mountain Park), showing cabin with swimming pool. Real photo postcard (RPPC), undivided back, postally unused, n.d. (late 1920s-1940s). The lake and swimming pool at our mountain home where we get as much as 7 ft of snow sometimes. The identity of the writer-homeowner is unknown. Dating: The stamp box is imprinted "Place Stamp Here" surrounded by the letters "AZO" and a square in each corner. AZO was a type of silver chloride photographic printing paper manufactured by Eastman Kodak from the late 19th Century to the early 21st Century. Squares appeared at the corners of the stamp box on RPPCs processed on AZO paper from 1926 to the 1940s. (Source: Philatelist and postcard dealer Ron Playle, 1937-2018, Playle's Auctions, accessed 2018). 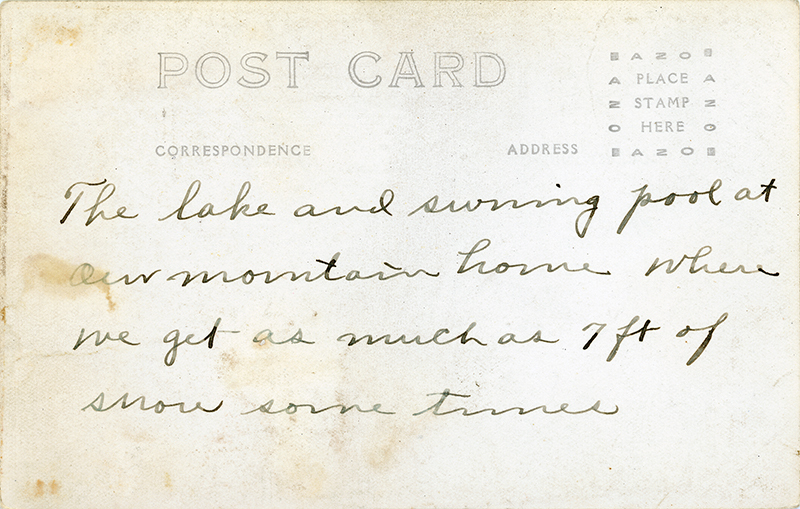 This one "feels" a bit earlier than the 1940s, but we can't prove it. Read: Frazier Park history by Bonnie Ketterl Kane (off-site). LW3461: 9600 dpi jpeg from original RPPC purchased 2018 by Leon Worden.